How Does an Ant Build Its Hill? How Do Ants Protect Themselves? Ohio's ant fauna currently includes seven subfamilies, 33 genera and 128 species. These numbers could increase as more of Ohio's ant habitats are surveyed. No ant species are considered endemic, or living only in Ohio. The state of Ohio includes several distinct ecological regions providing a diverse range of habitats for ants. One of Ohio's most common and diverse genera of ants are the Formica ant. 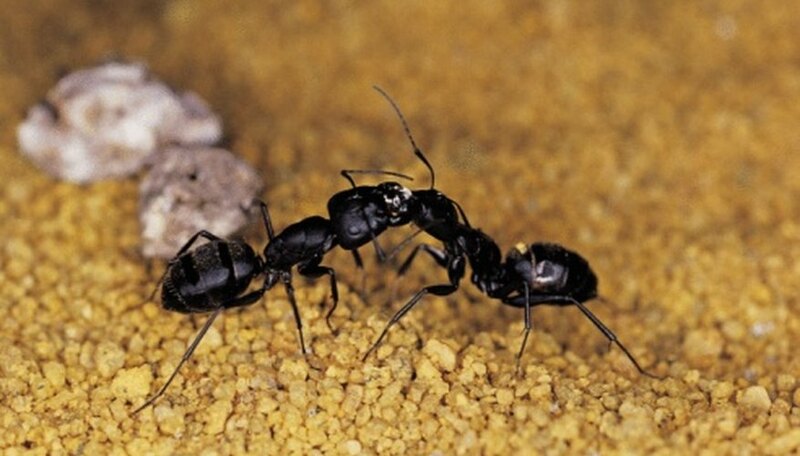 Members of the Formicinae ant subfamily are reddish or black or a combination of the the two colors. Formica ants build loose mounds of dirt and often spread out into large colonies. They inhabit open areas near forests and prefer to nest at the bases of trees and stumps. Some species of Formica ants benefit the woods by eating pests such as termites, bark beetles and sawfly larvae. Carpenter ants are large black ants that can grow up to an inch long. Members of the Camponotus genus, the most common species of carpenter ant is pennsylvanicus. These ants nest in dead wood of living trees and sometimes infest the moisture-susceptible wood of houses. Carpenter ants build reproductive parent colonies with a queen and worker ants. They also live in satellite colonies made up only of worker ants. Winged females can often be observed swarming in the springtime. Three species of fire ants are found in Ohio. They construct mounds and live under logs, bark and rocks. The small reddish-brown ants are aggressive and deliver a painful sting when disturbed. Fire ants are omnivorous and will eat almost any kind of plant or animal. They will sometimes attack small ground-nesting animals. Killing fire ants causes them to emit a chemical pheremone that acts as an alarm, causing other ants to swarm in an attack frenzy. Nine non-native ant species live in Ohio, including the widespread Tetramorium caespitum. Many exotic species colonize greenhouses and heated buildings. The temperate eastern Asian species Paratrechina flavipes has established itself in parks and woodlots of the Cleveland area. Pharoah's ants are a tiny yellow species that invade homes, traveling in ingoing and outgoing single-file lines. The species spread around the world by traveling on ships. They were named by Linnaeus, who believed they plagued Egypt during Biblical times. Whitmer, Phil. "Ants of Ohio." Sciencing, https://sciencing.com/ants-ohio-8338727.html. 13 March 2018.